Connecticut’s DEAD BY WEDNESDAY is pleased to announce their upcoming performance as part of the “Headbangers For Hatewear” showcase, sponsored by Hatewear Inc. 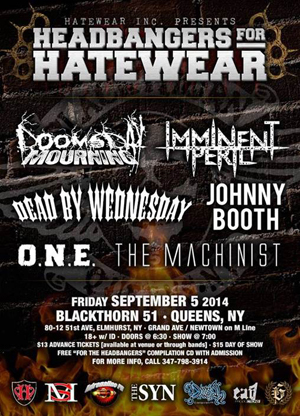 The showcase will take place on Friday, September 5, 2014 at The Blackthorn 51 in Elmhurst, Queens, NY (80-12 51st Ave). In addition to DEAD BY WEDNESDAY, other bands on the showcase include DOOMSDAY MOURNING, JOHNNY BOOTH, IMMINENT PERIIL, THE MACHINIST, O.N.E. and more! Doors open at 6:30PM with a 7:00PM start time, with admission set at only $13 with advance purchased ticket (available via the venue and the bands performing), and $15 at the door. The show is 18+ with valid ID. Plus, every person receives a Hatewear Inc. For The Headbanger's Brutal New Music Vol. #5 sampler CD with entry! DEAD BY WEDNESDAY’s new EP Death Of A Rockstar is out now via Ear One Productions. The album, produced by Nicholas T. Rage of TOXIC HOLOCAUST (HATEBREED, KINGDOM OF SORROW, JASTA), can be purchased as a limited edition digipack or hard copy NOW here: http://earoneproductions.bigcartel.com/. Death Of A Rockstar is the band’s fourth release. In 2011, the band released their third record, The Last Parade. Produced by Enoch Jensen at East Lake Recording Studio's in MA, this release was considered by the band as their Master Of Puppets. The release of The Last Parade was followed by a full U.S. tour with STRAIGHT LINE STITCH and DEFILER, sponsored by the clothing line Hatewear, Inc. DEAD BY WEDNESDAY went on to snag the “Best Metal” award two years in a row at the Connecticut Music Awards.